Arkon Slim Grip Apple iPhone 4 Mobile Phone Cradle with Vehicle Air Vent Mount . Suitable for the original Apple iPhone, the iPhone 3G / 3Gs and the iPhone 4 and for use with Mobile Phones or Smart Phones with a height of between 80mm and 120mm. If you are using a GPS SatNav application on your mobile / smart phone viewing it from a convenient air vent makes perfect sense. This mounting option includes Arkon's Slim-Grip universal mobile phone holder, the thinnest universal gripper style holder Arkon make. It is one of the few cradles that allow you to keep your protective skin or sleeve on the phone while it's in the holder. This mounting option is particularly suitable for mobile / smart phones with GPS applications as the cradle can be viewed both horizontally & vertically and has full adjustment for the perfect viewing position. The holder features adjustable support legs along with a spring loaded mechanism which grips your device firmly holding it securely in position. The Slim-Grip universal cradle is ideal if your or your family have multiple mobile phones. Suitable for: Apple iPhone Original, iPhone 3G, iPhone 3Gs & iPhone 4, Apple iPod Touch, Blackberry - all non-flip models, HTC all non-flip models, Motorola - all non-flip models, Nokia - all non-flip models, Palm, all non flip models, LG mobile phones - all non flip models, Samsung - all non flip models. The video is an example of the Arkon Slim Grip cradle may not show your actual device or mounting option. 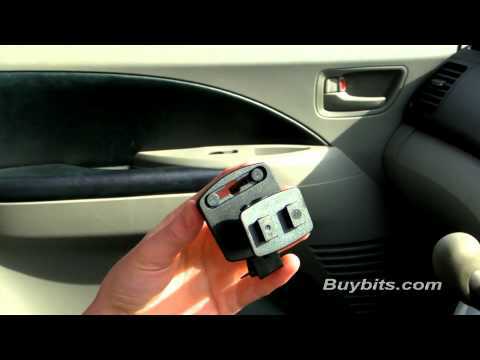 The video below is an example of the Arkon Slim Grip cradle and may not show your device. The Slip Grip iPhone 4 cradle allows you to keep on any protective case or skin while viewing Apple iPhone 4 from air vent. The spring loaded retaining clips will fit devices between 80mm & 120mm. This super slim gripper style allows the most chunkiest of cases to stay on the iPhone 4. Crocodile style clips are easy to position & remove. Ideal for swapping from vehicle to vehicle. The cradle can be rotated through 360 degrees so the phone can be viewed horizontally or vertically.